The Rotary Club of New Milford recently presented its December Student of the Month Award to NMHS seniors Hannah Kenny and Sean Murphy. Hannah is a member of the Athletic Council, the National, Math and French honor societies and received the SWC All-Conference Academic award three times for maintaining an above 90 average in classes while playing a sport. She is vice president of the French Honor Society, plays lacrosse and field hockey and volunteers with the Special Olympics cross country team. She plans to major in psychology with a goal of becoming a clinical psychologist. Sean is the recipient of CAS Governor’s Scholar Award, is a National Merit Scholar and received a Harvard Book Club Award. He is captain of the NMHS varsity soccer team and a Key Club member. He leads the Youth Agency Homework Club, is an ELL tutor and a lector at St. Francis Xavier Church. Sean plans to major in psychology and philosophy with a career goal of earning a doctorate and becoming an author. 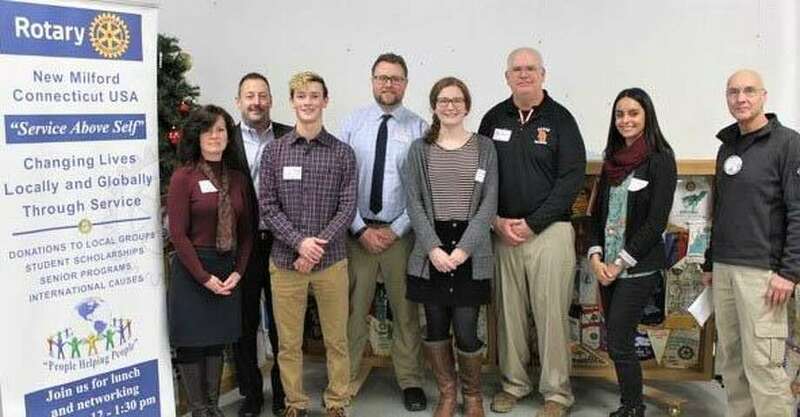 Above, from left to right are, Sean’s mother and father, Karen Murphy, Patrick Murphy, NMHS teacher Travis Swim, Sean, Hannah, Hannah’s father, Paul Kenny, NMHS teacher Sasha Cordero and Rotarian Tom McSherry.